With 30 sessions and 6 workshops, there was a wealth of information to take away from this month's SMX Advanced 2013. Now, the information has begun to settle, and three critical factors that have emerged as SEO non-negotiables are: social signals, mobile search and user experience. Again and again, these factors stood out — factors touted by the likes of Matt Cutts, Duane Forrester, Danny Sullivan, Eric Enge and, of course, Bruce Clay. Learn what the top-tier webmasters and SEOs are currently focusing on and let it guide your own efforts. Social media is an integral part of any Internet marketing strategy, as social media has the power to drive users to websites and therefore lead to conversions. In the SMX Ask the SEOs panel, Danny Sullivan advised Internet marketers and SEOs to "think social. Search has always been social. When we want an answer we turn to the people we know." He went to say not to do only "do" social, but to live it." While the value of Twitter and Facebook as marketing vehicles have been promoted by the online marketing industry for many years, the impact of two-year-old Google+ on search marketing efforts is still being discovered. All social platforms are not created equal, it seems. One major takeaway coming out of SMX Advanced 2013 was that Google rewards Google+ users. In the Ask the SEOs panel, Bruce Clay stressed the importance of Google+ (and hooking up authorship) and Greg Boser predicted that the value of Google+ will only become increasingly important. Danny Sullivan reported he, too, uses Google+ a lot, and that he published the same content to Facebook and Google+, as he has different audiences on each platform — a helpful time-saving trick for marketers who find their time stretched thin across social platforms. "Mobile matters. You'll see an exponential curve of mobile passing desktop traffic in the next two years," Matt Cutts said during the conference. 77 percent of mobile searches occur at home or work — even if a PC is nearby and readily available. The number of local searches on mobile devices quadrupled in 2012. Of mobile searches, 40 percent occur on tablets and 60 percent on smartphones. Global smartphone use will reach 2 billion by 2015. Local mobile searches (85.9 billion) are projected to exceed desktop searches (84 billion) for the first time in 2015. Sites must be optimized for both desktop and mobile traffic. Having a mobile presence is something users are beginning to expect — and if you don't have it, your competitors who do have it will steal your potential mobile customers. Now more than ever, customers expect brands to have a mobile presence. When creating your brand's mobile presence, remember that Google's official preference is responsive web design with consistent URLs that serve identical HTML to all devices and uses CSS to alter the pager's rendering. 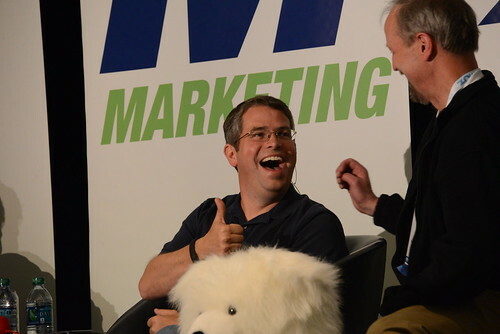 Matt Cutts reported that if SMX Advanced attendees could only have one takeaway, it should be this: Make something compelling and optimize the user experience. What, then, is compelling? Unique content that drives traffic and engages users — content that adds value to the 4 billion-plus pages on the Internet. It's no secret that Google is concerned, first and foremost, with the user — "focus on the user and all else will follow" is one of Google's mantras. When it comes to creating that which compels, a webmaster's task is no different; they, too, must focus on the user — and that which compels him. Whether you're creating a page, adding a video, posting a picture or writing an article, you should have the user in mind. What is he searching for? What is not already available to him online? What is available but could be made fresher or better? By answering these questions that focus on the user experience, your content will naturally be compelling. In addition to creating compelling content, webmasters must optimize the way the user experiences the content. Use file compression where appropriate. Reduce server load and number of requests. Consider using content delivery networks where appropriate for large digital media assets. Another way to optimize the user experience is to implement schema markup. In addition to helping search engines more easily ingest the material on a site, schema markup allows you to structure the way your site appears in the search results. Consider what will work for your brand and then structure accordingly. There are a lot of options -- you can add ratings, reviews, recipes, videos and more. "Schema.org provides a collection of shared vocabularies webmasters can use to mark up their pages in ways that can be understood by the major search engines: Google, Microsoft, Yandex and Yahoo!" For permission to reprint or reuse any materials, please contact us. To learn more about our authors, please visit the Bruce Clay Authors page. Copyright © 2013 Bruce Clay, Inc.